News International has proposed closing its loss-making free evening newspaper The London Paper. 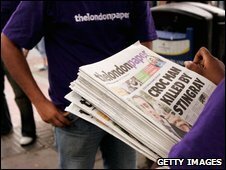 The paper, which competes with Associated Newspapers' London Lite, made a pre-tax loss of £12.9m ($21.2m) in the year to 29 June, 2008. It will now consult its 60 staff over the possible closure. Recently, Rupert Murdoch, the chairman of News International's parent company News Corporation, said it would begin charging for online news content. "You can't give it away on the streets and then start charging for it online," said Lorna Tilbian, media analyst at Numis Securities. She added that there was only room for one free evening newspaper in London and that it was much closer to the core business of Associated Newspapers than it was to News International. And international ratings agency Fitch predicted that more newspapers would close amid dwindling advertising revenues. "The closure of thelondonpaper... is a sign of the extreme steps ad-funded media companies are having to take to protect their margins in the current environment," Fitch said. "The current extraordinary market conditions are forcing parts of the UK newspaper industry to take steps they would never previously have entertained -- including taking a cold, hard look at the viability of all their titles." The London Paper was established in 2006 and had a circulation of 500,348 last month. However, News Corporation now wants to concentrate on its main publications: The Sun, The Times, News of the World and the Sunday Times. "The strategy at News International over the past 18 months has been to streamline our operations and focus investment on our core titles," said James Murdoch, the chairman and chief executive Europe and Asia for News Corporation. "The team at The London Paper has made great strides in a short space of time with innovative design and a fresh approach but the performance of the business in a difficult free evening newspaper sector has fallen short of expectations. The paper will continue to be published during the 30-day consultation period. Its closure would mean an end to the London freesheet battle, which began when London Lite was first to launch on 30 August 2006. The London Paper launched days later, on 4 September. When Associated Newspapers launched London Lite, it was also publishing its free morning paper, Metro, and the charging London Evening Standard. London Lite's managing director Steve Auckland said the imminent closure of his paper's rival was "a sad situation"
"But it is, as everyone knows, a very competitive market place and nowhere more so than in London," he added. The battle has eaten into the circulation of the Evening Standard, control of which has since been sold to the Russian billionaire Alexander Lebedev.